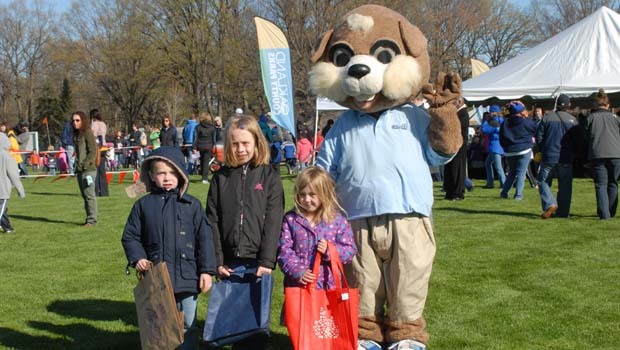 Great Marshmallow Drop 2019 – New location for 2019 only – Worden Park in Royal Oak (Lexington Blvd & Crooks Rd, Royal Oak, MI 48073) due to ongoing improvements being made at Catalpa Oaks County Park Southfield – Oakland County Parks has released information about the Great Marshmallow Drop 2019. This year’s free Marshmallow Drop event takes place at Worden Park in Royal Oak on Friday, April 19, 2019. The marshmallows are set to drop via helicopter at 10a! 15,000 marshmallows will be dropped from a helicopter to be turned in for a prize! You only need to exchange one marshmallow to receive a prize—this is not a competition. The Great Marshmallow Drop 2019 at Worden Park in Royal Oak, Michigan will host 3 age groups for separate marshmallow drops… 4 and younger (plus individuals with disabilities), ages 5-7, and ages 8-12. Marshmallow Drop will be at Worden Park for 2019 only due to park improvements at Catalpa Oaks County Park. The event will return to Catalpa Oaks in 2020. Below is a review from a previous Great Marshmallow Drop and video footage of the 15,000 marshmallows being copter-dropped! My kids could not wait to go to the Oakland County Great Marshmallow Drop at Catalpa Oaks County Park. When we got there we saw thousands of people waiting for the helicopter to appear and drop more than 15,000 marshmallows for all the kids to find. Despite the large crowd, Oakland County Parks & Rec staff did a great job dividing everyone into three age categories and having plenty of staff to direct all the people traffic. A stage was also set up for the announcer to guide everyone through the process. The Great Marshmallow Drop is a free event. If you plan on going, try to get there at least 20 minutes before 10a as the event draws a big crowd and parking can be difficult. After the drop, the children each found one marshmallow and turned it in for a prize-filled egg. The staff made it very clear that only one marshmallow was needed to receive a prize; this was not a competition and the event was completely free. In addition to the prize-filled egg, all the kids received a free pass to an Oakland County water park the year I did this review! The first Oakland County Parks Marshmallow Drop in 1978 in the Oakland County courthouse parking lot. After more than 30 years, the parks system has brought back this unique event. Visit www.OaklandCountyParks.com for more info on Great Marshmallow Drop 2019. I’m glad it’s a Friday, kids are out of school and I have to work Saturday morning when everything else is going on. Why the heck would you make this on a Friday when a lot of people are working? We’re you at the same event I was last year?? This was poor execution! Many kids did NOT get a single marshmallow!! Because so many parents let their kids in front take bags full. And, when I spoke to staff how we couldn’t find a single marshmallow, they told us go get a prize…they didn’t care, my kids came for a marshmallow, that was the fun. Disappointing.